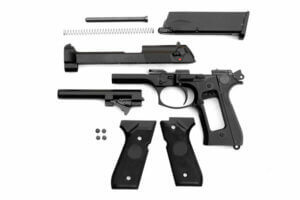 Application: Abrasive blast cleaning of gun components to prepare surface for coating application. A major defense manufacturer in the firearms industry needed the ability to improve the surface finish of gun components prior to final finishing. The parts being processed had minor surface imperfections such as scratches and grinding marks. The manufacturer had tried both outsourcing the abrasive blasting to a job shop as well as hand blasting in-house to prepare the surface for coating. 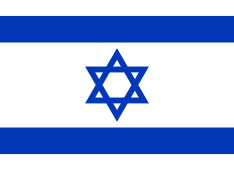 In either case, however, they encountered problems with the consistency of the finish. This, in turn, was affecting the overall quality of the end product. As a result, they were looking for a solution that would result in a consistently high quality finish every time. Empire technical sales personnel and application engineers met with the defense manufacturer to evaluate their current processes and determine their requirements. 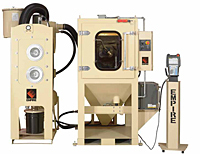 After careful analysis, Empire recommended the installation of several Single Piece Flow Abrasive Blast Cleaning Systems to provide an automated solution that would reduce inventory requirements, conserve floor space and, most importantly, guarantee the consistency of the final surface finish. 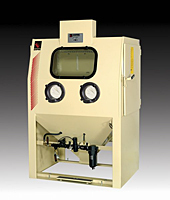 Empire’s Single Piece Flow Systems are available in two sizes, 38” D x 30” W and 24” D x 24” W. These compact, single-station closed cell machines are ideal for blasting cylindrical parts such as barrels, scopes, and hand guards. 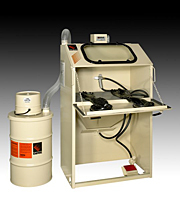 The larger of the two systems, the 38” x 30” features a 50” high blast area with four (4) oscillating suction blast guns. The gun movement is controlled by an 18” DC drive belt oscillator. 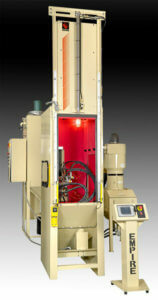 Parts are inserted into a customer-supplied fixture and then loaded onto a shaft in the blast cabinet. The shaft rotates while the blast gun nozzles move in vertical strokes designed to cover all areas of the part. An integral PLC controller manages the machine functions including blast pressures, oscillation speed, number of strokes and other variables affecting cleaning, peening and finishing. Rotation speed is operator controlled via potentiometer. 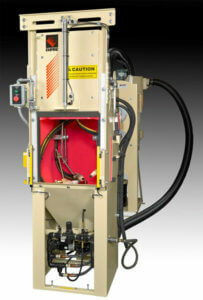 Operation is simple and efficient – just insert part, close compartment door, set parameters and start the blast cycle. 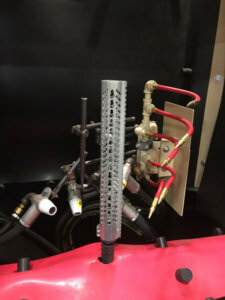 The 24” x 24” system is a similar unit that is ideal for smaller parts. 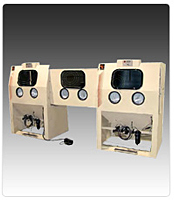 Featuring three (3) fixed suction blast guns, blasting of the part is also accomplished by rotating the fixture while the blast guns cover all areas of the part. With this unit the blast cycle is based on time as opposed to stroke count. 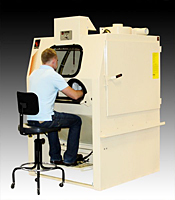 All machine functions are available on the operator control panel including setting blast time and rotation speed. Available material handling options for both models include a vertical sliding door (replaces swing-out door) and light curtains and/or whisker switch to enhance operator safety. 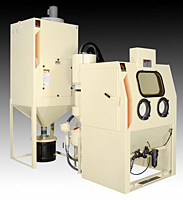 Empire was able to provide economical, flexible abrasive blast cleaning systems with PLC or manual control that not only increased productivity, but also assured a consistent finish and improved overall quality control. 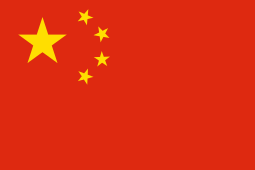 We able to help the manufacturer meet the demands of its customers and give them a winning edge in an increasingly competitive global marketplace.